Atletico Madrid claimed a big victory over Juventus in the Champions League last 16 first leg thanks to two goals from their centre-backs at set-pieces. Diego Simeone's side were denied a penalty and an Alvaro Morata goal by the video assistant referee before they opened the scoring. Jose Maria Gimenez pounced from eight yards after Morata's header was blocked by Mario Mandzukic. Diego Godin netted a half-volley, via a deflection off Cristiano Ronaldo. Striker Costa and midfielder Thomas Partey of Atletico Madrid and Juve left-back Alex Sandro will all miss the second leg on Tuesday, 12 March after picking up their third bookings of the tournament. 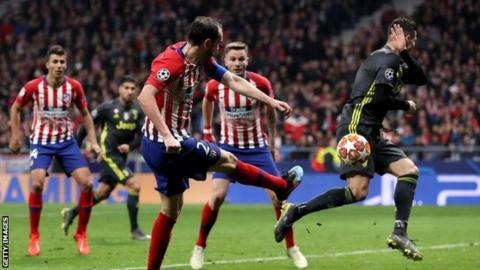 Ronaldo - who is aiming to win a sixth Champions League and a fourth in a row - had Juve's best chance as his powerful 35-yard free-kick was tipped over by Jan Oblak. A consequential win for Atletico? Atleti have not been at their best in La Liga this season but fully deserved a victory in a game involving the teams to lose four of the past five Champions League finals. They were denied a first-half penalty, which was initially awarded when Mattia de Sciglio brought down Costa, who was making his first start since 2 December following injury. The referee overturned his decision after the VAR officials told him the offence had taken place outside the box. Atleti stepped things up in the second half and Costa missed a glorious one-on-one chance before Antoine Griezmann had a lob brilliantly tipped on to the crossbar by Wojciech Szczesny. They thought they had taken the lead when former Juve striker Morata headed home from Filipe Luis' cross but after watching the incident again on a pitchside screen, referee Felix Zwayer ruled the Chelsea loanee had shoved Giorgio Chiellini before getting the ball. Their heads did not drop however and Morata, a second-half replacement for Costa, had a hand in the opener as his header was half-cleared by Mandzukic to Gimenez, who blasted home. Five minutes later, it was another goal by another Uruguayan central defender. Another ricochet from Mandzukic found its way to Godin, who hit an acrobatic effort from a tight angle into the back of the net. Nine of their starting line-up have played in a Champions League final for Atletico, with four playing in both 2014 and 2016. With more performances like this they could get a chance to go one better - this season's final on 1 June is to be played at their Wanda Metropolitano home. Ronaldo's Champions League reign in jeopardy? Ronaldo joined Juventus from Real Madrid in the summer for £99m hoping to win the Champions League with a third different club. He has won the past three with Real, and four in the past five years - as well as the 2008 trophy at Manchester United. He was meant to be the final piece in the jigsaw for Juventus, who last won European club football's greatest trophy in 1995-96. But despite being the tournament's all-time top scorer - with 121 goals - and winning or sharing the Golden Boot for six consecutive seasons, he has not had quite the same impact in Europe for Juventus. The 19-goal top scorer in Serie A has only netted once in his six European games for the club and was sent off on his debut in the tournament against Valencia. The 34-year-old had seven shots against his old city rivals, but only one on target - a wonderful long-range free-kick well saved by Oblak. And in three weeks' time at the Allianz Stadium, Juventus need him to put in one of his greatest Champions League performances if they are going to breach one of Europe's top defences - twice. Atletico have never lost a home game in the knockout stages of European competition under Simeone (W12 D4). Juventus have faced Atletico more times without winning than against any other opponent in the Champions League (D1 L2). Atletico have kept a clean sheet in all three of their Champions League games against Juventus. Since the start of the 2013-14 season, Atletico have kept 12 clean sheets in the Champions League knockout stages - only Real Madrid (13) have managed more. Juventus have been eliminated on each of the previous four occasions when losing the first leg in a Champions League knockout tie, with the last time they were able to progress after a first-leg defeat coming in 2005-06 against Werder Bremen. Gimenez has scored two goals in the Champions League this season - he had not netted in any of his previous four campaigns before 2018-19. Juventus defender Leonardo Bonucci made the 500th appearance of his club career, with 55 of those coming in the Champions League. Match ends, Atlético de Madrid 2, Juventus 0. Second Half ends, Atlético de Madrid 2, Juventus 0. Attempt missed. Cristiano Ronaldo (Juventus) header from the left side of the six yard box is too high. Assisted by Federico Bernardeschi. Attempt missed. Thomas Lemar (Atlético de Madrid) left footed shot from outside the box is too high. Assisted by Filipe Luís. Corner, Juventus. Conceded by Jan Oblak. Attempt saved. Federico Bernardeschi (Juventus) left footed shot from the centre of the box is saved in the top centre of the goal. Assisted by Cristiano Ronaldo. Attempt missed. Cristiano Ronaldo (Juventus) left footed shot from outside the box is too high. Substitution, Juventus. João Cancelo replaces Blaise Matuidi. Goal! Atlético de Madrid 2, Juventus 0. Diego Godín (Atlético de Madrid) right footed shot from a difficult angle on the right to the centre of the goal following a set piece situation. Attempt blocked. Diego Godín (Atlético de Madrid) header from the centre of the box is blocked. Assisted by Antoine Griezmann with a cross. Juanfran (Atlético de Madrid) wins a free kick on the right wing. Corner, Atlético de Madrid. Conceded by Wojciech Szczesny. Corner, Atlético de Madrid. Conceded by Giorgio Chiellini. Goal! Atlético de Madrid 1, Juventus 0. José Giménez (Atlético de Madrid) right footed shot from the centre of the box to the bottom left corner following a corner. Attempt missed. Álvaro Morata (Atlético de Madrid) header from the centre of the box misses to the left. Assisted by Thomas Lemar with a cross following a corner. Corner, Atlético de Madrid. Conceded by Blaise Matuidi. Attempt blocked. Thomas Lemar (Atlético de Madrid) right footed shot from outside the box is blocked. Substitution, Juventus. Emre Can replaces Miralem Pjanic. Substitution, Atlético de Madrid. Ángel Correa replaces Koke. Corner, Juventus. Conceded by Rodrigo. Substitution, Atlético de Madrid. Thomas Lemar replaces Thomas Partey.